Many of you probably woke up this morning deep in a Halloween sugar hangover. Well, I consider this recipe the “hair of the dog” for recovering from a candy overdose. Let’s also remember we’re going straight into Thanksgiving and Christmas party season, so we need to be grooming our waistlines for the marathon of upcoming indulgences coming our way. 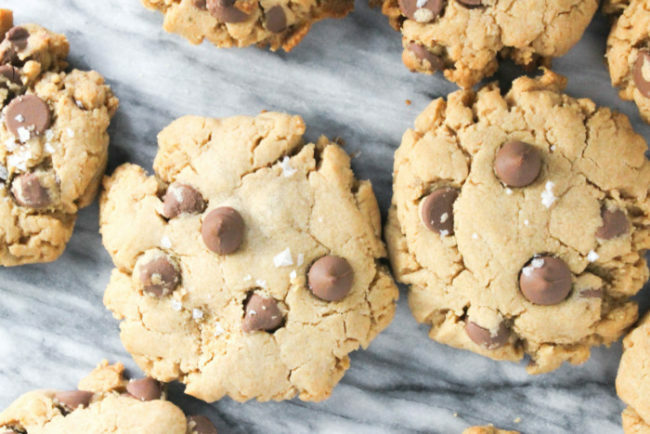 So now that I’ve got you convinced about why these cookies are the right decision to make today instead of swearing off carbs, let me tell you about just how heavenly the sweet and salty combo of these Salted Peanut Butter Chocolate Chip Cookies is. My love for the peanut butter and chocolate combo started around Halloween as a kid. My brother has a severe nut allergy, which meant I had all of the leverage in our Halloween candy trading event after we’d get back from Trick or Treating. (Yes, I learned to leverage synergies at the ripe age of six). This usually resulted in me giving up all of the gross Charleston Chews, Junior Mints and while I liked Nestle Crunch, I didn’t value them as much as a Reese’s Peanut Butter Cup. So all the Snickers and Reeses came my way, the medicore candy went his way, and we convinced our little sister that Mike N’ Ikes were good. All this to say, I have loved the sweet and salty combo of peanut butter and chocolate for a very long time. I’ve always loved peanut butter cookies, but the classic sugar rolled-two-fork-pressed peanut butter cookies were the only kind I had eaten growing up. 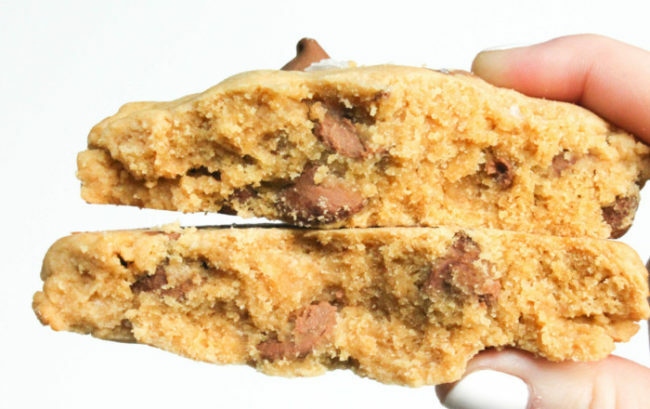 Sometimes they are too flat and crunchy, other recipes with peanut butter often are too fluffy. But these bad boys, they are the perfect combo of big, thick, dense, and delicious. Don’t believe me? Let me show you. I like big cookies and I cannot lie. That is the trick with this recipe – the bigger the better. The initial batch I made were regular sized tablespoons of dough and I didn’t press them down firmly. So while they were equally delicious, they were too puffy and didn’t have what I was looking for in the whole package. So when I doubled the size, so that I could only fit 5 cookies per baking sheet, and I pressed them down firmly before topping with some extra chocolate and flaked sea salt, jackpot. Flaked sea salt is another key ingredient to this recipe that you want to be generous with when topping the dough before baking. 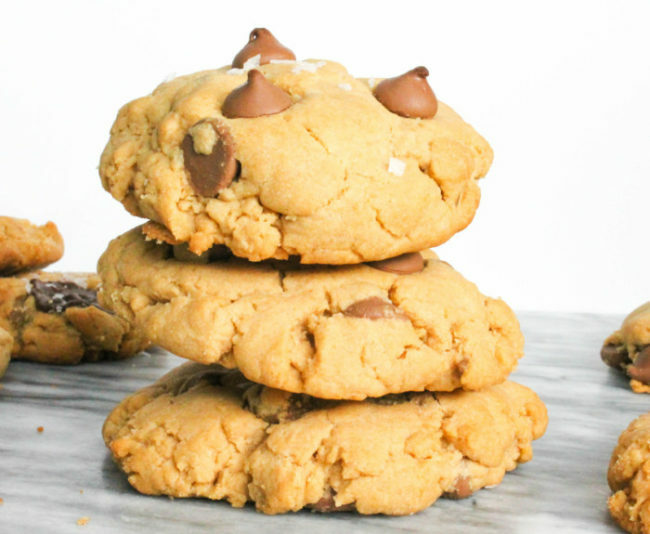 I’m also a big fan of topping the dough with a few extra chocolate chips, but I used most of the bag in the batter, so I chopped up a few pieces of a dark chocolate bar that I had in the pantry and topped a few cookies with a square and that was SO good. 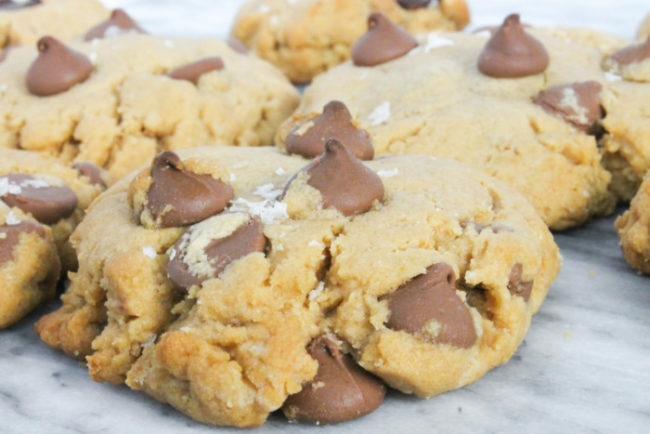 These cookies would also be a good use of any extra chopped up Halloween candy that you don’t want to take straight to the face. Chopped up Hersheys bars would work well in this recipe. 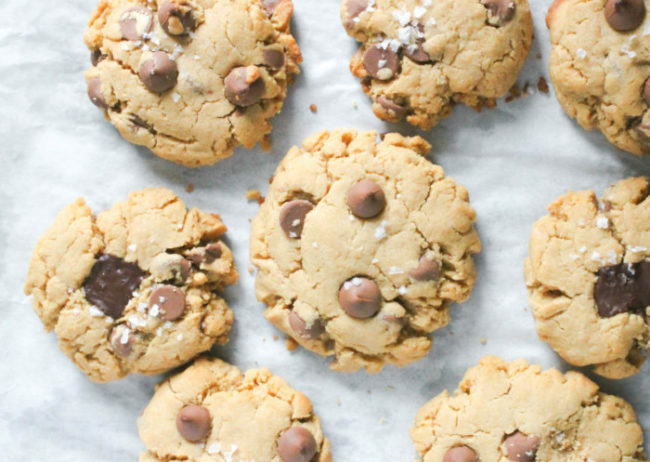 So if you are in it to win it this Holiday season, gear up for the sugar marathon with a batch of these delicious Salted Peanut Butter Chocolate Chip Cookies and keep that sugar high going until New Year’s Resolutions. 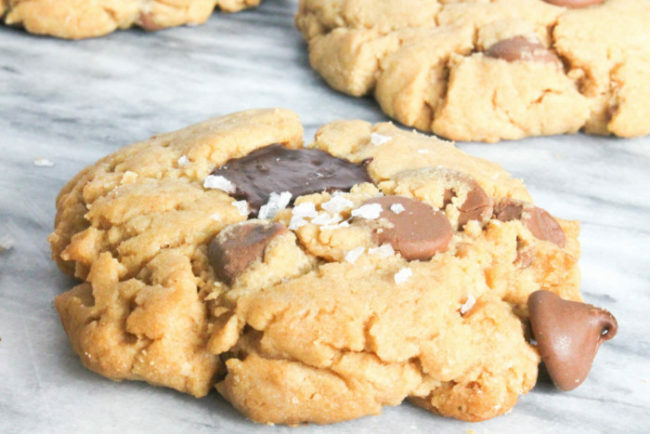 The perfect sweet and salty combo for the peanut butter chocolate lover! Brown the butter in a medium saucepan and set aside to cool. Meanwhile, preheat the oven to 375 degrees F.
In a large bowl, whisk together the butter and peanut butter. Slowly mix in the sugars until incorporated. In a separate bowl sift together the flour, baking soda and baking powder. Slowly add the dry ingredients to the batter mixing just until they are incorporated. Fold in the chocolate chips until evenly distributed. Chill the dough for 15 to 30 minutes. On a sil-pat or parchment-lined baking sheet, place large scoops of dough (about 3 tablespoons) at least two inches apart. 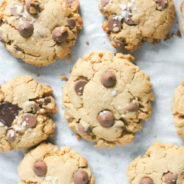 Press down firmly, and top with sea salt and extra chocolate chips. Bake at 375 degrees F for 10-12 minutes, until the edges are lightly golden. Let the cookies sit on the tray for a few minutes to firm up before transferring to a wire rack to finish cooling. Enjoy!